Protesters in Thailand have staged one of the country's biggest demonstrations since the 2014 military coup as they campaign against a luxury housing development on forested land. More than 1,000 people gathered in the northern city of Chiang Mai. They rallied against a housing project being built for judges and officials in the foothills of a sacred mountain. The march went ahead in defiance of a ban on public gatherings imposed by the junta, which seized power in 2014. "Around 1,250 people took part in the protest," Police Colonel Paisan, deputy commander of Chiang Mai Police, told Reuters news agency. "The protesters were focused on environmental issues and not politics, and they cleaned the street afterwards." 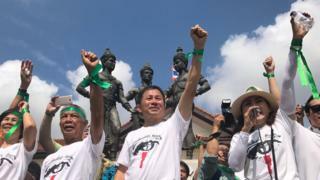 Demonstrators, many wearing green ribbons, demanded the dismantling of new buildings that encroach into the mountain, Doi Suthep. The forested area contains a popular temple and is considered by some to be sacred. They gave the government seven days to comply or face more protests. But the authorities have defended the development, insisting it was erected legally on government-owned land that does not infringe on the national park covering the rest of the mountain. About 1 billion baht ($32 million; £23 million) has been spent on the project, which includes offices as well as housing, and it is nearly complete, according to the Bangkok Post. Anger over the construction comes amid growing frustration about special treatment for Thai elites and officials.